Headquarters of the State Pollution Control Board, Odisha is located at ParibeshBhawan, A/118, Nilakantha Nagar, Bhubaneswar in Khurda District. The Board has established its state-of-art Central Laboratory at B-59/2 & 59/3, Chandaka Industrial Estate, Patia, Bhubaneswar. The details of mailing addresses, Telephone/Fax Nos., E-mail/website and jurisdiction of the Head Office, the Central Laboratory and Regional Offices are given in following table. 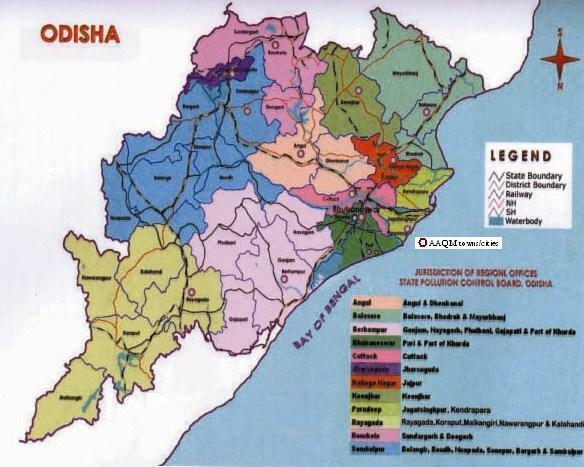 The twelve Regional Offices of State Pollution Control Board are illustrated in Odisha Map in annexed Fig.